Unless otherwise stated, our terms are strictly net cash. A credit surcharge of 10% of the total value will be added to all invoices. This surcharge may be deducted if payment is made within 28 days of the date of invoice - payment thereafter will be strictly net and includes the credit charge. If the invoice is not paid after a further one month, we reserve the right to charge interest at the rate of 2% per month on the outstanding amount. Title to the goods is reserved and shall not pass to the buyer until such time as payment has been made in full. All orders over £200 in value will be delivered to the Customer's own farm free of charge (East Anglia only). Orders valued at £200 and under will have the carriage charged at cost. The seeds may be dressed with Chemical Seed Dressing and whilst every precaution is taken we cannot be held responsible for any damage caused thereby. Diseases of plants can be transmitted by the wind, by insects, by animals or by human agencies and may be seed borne or soil borne. We believe the seed hereby sold to be free from latent defect, but it is not a condition of sale nor do we warrant that any seed sold by us shall be free from such defect and will not be responsible in any way for the resultant crop. Title to the goods remains with the supplier until invoice(s) are settled in full. The seller retains the right of title over the goods and any income from subsequent crops or derived products until the entire outstanding amount is settled. The seller reserves the right to suspend other or outstanding deliveries until outstanding amounts have been settled. General Data Protection Requirement. 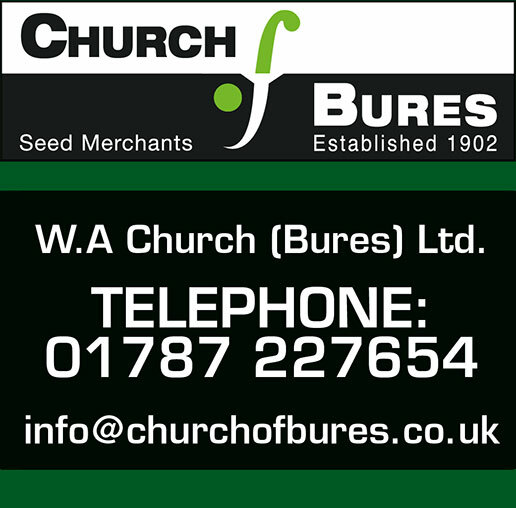 Church of Bures will never share or sell our database to any third parties. Our website has not been set up to request any personal or work email addresses or further private information that could effect your or your company being targeted by third company marketing companies. However, our website and office database is not secure and therefore cannot guarantee that we could be spied upon from third parties to gather this information. All correspondence between you/or your company and Church of Bures is entirely held at your own risk. Seed returned will only be credited in full, subject to our seal being unbroken and that we can sell elsewhere during the season purchased. A handling fee of 15% will be charged on any seed returned. NB - This does not apply to mixed seeds, or those with a chemical treatment. Seeds sold by us are guaranteed to comply at the time of delivery with the EU Seeds Regulations currently in force. All information contained in the catalogue or given by our personnel and relating to varieties, varietal characteristics or periods of maturity or fitness for any particular purpose or otherwise relating to the performance of seeds is given for general guidance only. Variation in local or climatic conditions can render such information inaccurate. Customers are therefore advised that any such information given to them does not constitute a representation by us as to these matters and should not be relied on as such. Customers should satisfy themselves that any seeds which they order are of a variety and performance satisfactory for their requirements and order such seeds at their own risk. Customers are advised that our personnel have no authority to give more than general guidance as described above to customers and we disclaim liability for any advice given or opinion expressed by them. Such advice is followed, or opinion acted upon, entirely at the customer's own risk. Protected varieties of vining peas are protected by plant breeders’ rights under either The Plant Varieties and Seeds Act 1964, The Plant Varieties Act 1997 or Regulation (EC) No. 2 100/94 or subsequent directives or acts. Permission to use farm-saved, bypass or intentionally grown seed is not automatically given. By purchasing seed of protected varieties the buyer agrees to abide by the laws, practices and operation of the directives and acts and to allow BSPB (British Society of Plant Breeders) - acting on behalf of the Rights holder - full access to all relevant documentation. The buyer should hold or should obtain a licence from BSPB before using any of the seed as described above. The buyer must comply with the directions given and agree to make any and all payments required. The giving or sending of an order to us constitutes an acceptance of the Terms by the Buyer who if they do not accept the Terms, must return the goods forthwith. Payment can be made by cheque, credit card or debit card. Delivery will be charged at cost on small orders.